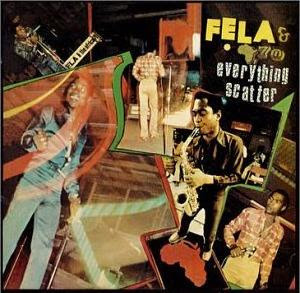 "Everything Scatter/Noise for Vendor Mouth" is another gem in the Fela two-albums-on-one-CD reissue series on MCA. It should be noted that unlike some of the other titles in this series, the tracks that make up the "Everything Scatter" LP -- the title cut and "Who No Know Go Know" -- were previously available on CD on the Celluloid label in the late 80s. "Scatter" was part of the original "Zombie" disc, and "Who No Know" was on "Mr. Follow Follow." Both "Everything Scatter" and "Noise for Vendor Mouth" (and its b-side "Mattress") were originally released in 1975. This was the beginning of what was arguably Fela's greatest period, and in the next three years he would release more than a dozen albums! While "Zombie" and "Opposite People" are clearly the essential recordings from this period, this disc, and all of the Fela reissues, are really indispensable.